Udah tau software portable ? Itu... software yang tidak perlu diinstall ke komputer seperti jaman DOS dulu. Kalau sekarang software2 Windows kan harus diinstall dulu baru bisa jalan, tidak bisa main kopi aja seperti jaman DOS dulu. Nah kalau software portable ini tidak perlu install, bisa langsung jalan. Jadi bisa dikopi ke USB Flash Disk agar bisa dibawa kemana2. WinPenPack adalah paket kumpulan software GRATISan yang portable. Si winPenPack sudah mengkategorikan software2 tersebut sehingga sesuai dengan nama paketnya, seperti misalnya Paket wPP Flash Web itu ditujukan untuk web developer atau wPP Flash Game ditujukan untuk para penghobi game. Silahkan kunjungi situs winPenPack - http://www.winpenpack.com/ untuk informasi lebih detilnya. 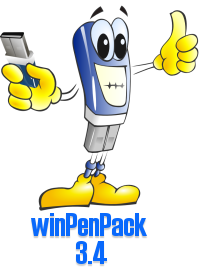 winPenPack is an applications environment of Free Softwares, modified for being run and used from an USB pendrive, without need of installation. The removable device, so, is no more a simple data container, but becomes a really self-contained environment, within programs and documents are homogeneously integrated. "Portable" softwares included into winPenPack does not need to be installed, does not write their settings into host PC, and can be easily carried between multiple computers through any external device, as removable hard disks or USB pendrives. After inserting the USB pendrive into a free USB port of host PC, user will have immediately available a collection of pre-configured and ready to use programs, subdivided in categories and executable through a practical menu, analogue to Windows Quick Launch, the winPenPack Launcher. User will feel as is working on its own PC, with web browsers, e-mail clients, image and drawing editors, chat clients, PC maintenance and security, school, development. All he needs, always available. All these features make winPenPack extremely useful in any field.